The New Moon of the Hebrew month of Kislev, which falls out this year on November 12, reveals the latent potential of the entire month. 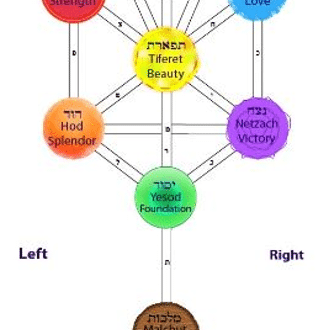 The month of Chanukah – the month of light! Read on to discover how the month of Kislev embodies the soul’s journey from concealment to revelation and how you can take advantage of the power of Kislev to access your innermost core. As well as how to download your free Rainbow Meditation. If we break Kislev into its two syllables, they form the words “kes lo” which literally means “cover” (כס) “him” (לו). The most basic reading of the word “Him” is as referring to the concealment of G-d. The receding sun and emergence of winter is a physical manifestation of what’s happening in the spiritual realms at this time. G-d’s presence in the world is less apparent to us and also more challenging to tap into as the world goes into hibernation. A secondary reading brings a personal dimension to the cosmic map. Here the word “him” is assumed to be referring to any individual person. We can easily understand how G-dliness is concealed in the winter. The light of the sun becomes hidden and less powerful and consequently we find ourselves in a mood of contraction. The second explanation, however, uncovers a deeper personal message. To enable us to peel open this personal application, a word on numerical value is in order. In Hebrew each letter has a corresponding numerical value. And the word “lo” (לו) has a numerical value of 36. How does this map onto our own lives? 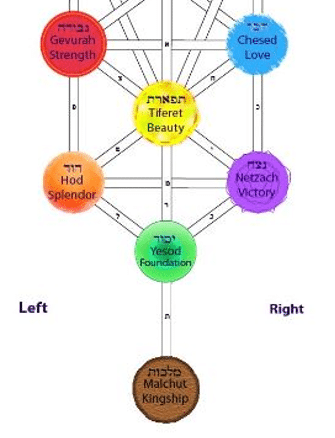 The Kabbalistic Tree of Life describes 6 core emotional faculties. When we take these six core emotional building blocks and multiply them by each other – each as it is manifested and included in the others – we total 36. One of our primary tasks in life is to refine our emotions in the service of G-d. When we work through our latent potential in all its colors, not only our heart center but the entire torso – our emotional trunk, becomes luminous and radiant. At this level of reading the word Kislev is addressing quite the opposite of concealment! We are being told: The dimension of kes (כס) or “concealment” must become lo (לו) “revealed.” One’s entire being, the full range of the emotional spectrum, must emerge and shine. Whilst this is an ongoing mission for each of us, we have an added ability during the entire month to reveal this inner light. The combination of kes (כס) and lo (לו) as expressed in the month of Kislev is therefore to reveal this hidden true identity. The Lubavitcher Rebbe explains that when the moon is full, it is farthest from the sun. When the moon is black and not yet revealed, it is in fact closest to the sun. That astronomical fact plays out in our own lives. We all want to be in a state of revelation – feeling full and happy with ourselves and our lives. It’s much harder to be in a state of darkness and surrender in peace knowing that all if from Above. Ironically it is when we are in this darkness that we are actually closest to Holiness and from this state we can emerge in a more powerful and manifest way to reveal the greatness of who we are. Each of us can look at our own life and see evidence of this principal. Most often our most intense and deepest growth emerges from “being close to the sun,” from those times in which we have felt G-d to be absent and felt alone in the darkness of our circumstances. Thus it is precisely in the cold winter month of Kislev, when the sun’s light is weaker and G-d’s radiance is concealed, and we feel a little shut down, that we can activate these inner lights. The month gifts us with a time bound additional ability to convert the darkness and emerge into the light. Take advantage of the latent power of Kislev! For this week only I am offering a way to help you access these hidden soul powers for FREE. I hope you enjoy my gift. I send it to you with love. Click here to receive the Rainbow Meditation – A Guided Journey Through the Lights of Your Soul for FREE! At checkout, enter coupon code rainbow to receive your gift. Share the revelation of Kislev with your friends! Pass this on to friends and family and feel the joy that comes with being a lamplighter. Thanks for helping others access the tremendous spiritual power of light. Today’s post and my gift to you is in honor of Chaya Mushka, the daughter of Rochel. Rochel and I met when she was a student in 10th grade. How blessed I was to meet her. We both know our relationship became a rich blend of friend-sister-daughter. When Rochel’s daughter Chaya Mushka passed away in infancy, the light by which her mother lived made it abundantly clear to me that Rochel was also my teacher. Today is the 9th anniversary of Chaya Mushka’s passing. She brought radiant light into the world, not only through her own being but through the light she generated through others. On her Facebook page this evening, Rochel wrote, “Tonight is the 9th Yartzeit of our daughter Chaya Mushka. The only gift that we can give to people who’ve passed is a mitzvah in their honor. Dear friends, if you can commit to one extra mitzvah in her honor it would mean the world to us! ~ Rochel & Shalom Meir.” I offer this meditation to you in the merit of her shining soul.